Oddly enough, the way that I came up with the idea for an Evernote PowerPoint template was unexpected actually. You see, I’ve been juggling multiple websites and design projects for years, and it’s always been a struggle to keep my notes and thoughts organized as I come up with new ideas for illustrations and presentation templates. I’m always thinking of new things, and up until several years ago the best I could do to keep track of it all was an Excel spreadsheet. It was a clumsy and awkward way to stay organized to say the least. My discovery of Evernote and the things it could do was a total lifesaver. Right from the start I knew we were going to get along well due to the fact that it has a really powerful search and tagging system built into it. It was love at first sight. I’m pretty hard-core about keeping everything that I do neat and orderly with keywords and tags, so this was a perfect fit. And I’ll be the first to admit that it’s not for everyone – I’ve recommended this app to several colleagues of mine who quickly dismissed it as something that wasn’t going to work for their own workflow. And that’s fine – everyone has different preferences! 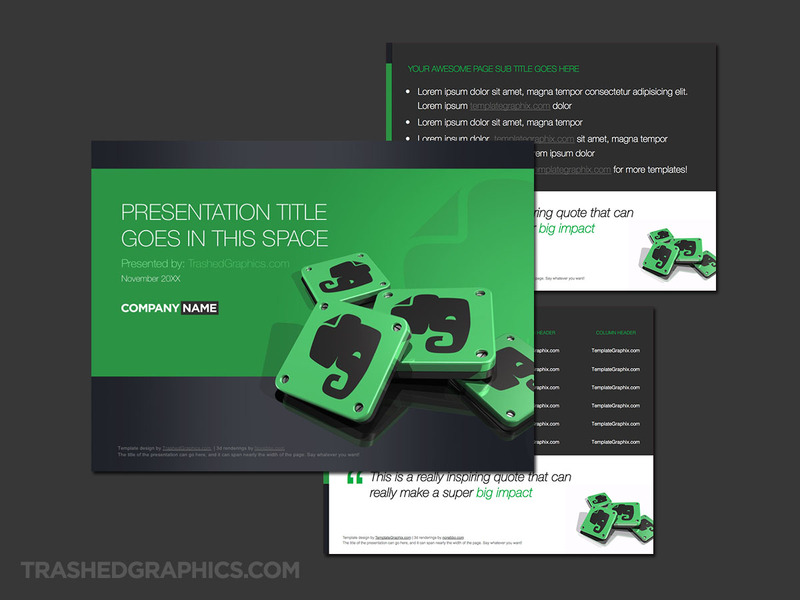 Anyway, I thought it would be fun to show my appreciation for this app by creating a PowerPoint template with 3d Evernote logos piled up just as I did for my Pinterest app icon PowerPoint template earlier last year. The composition is exactly the same as a matter of fact, but the colors have been changed out to fit with the current Evernote Design language. Never in a million years did I ever think I’d create an Evernote PowerPoint template, but here we are. As a little bonus, I actually created two versions of this Evernote template: dark and light. 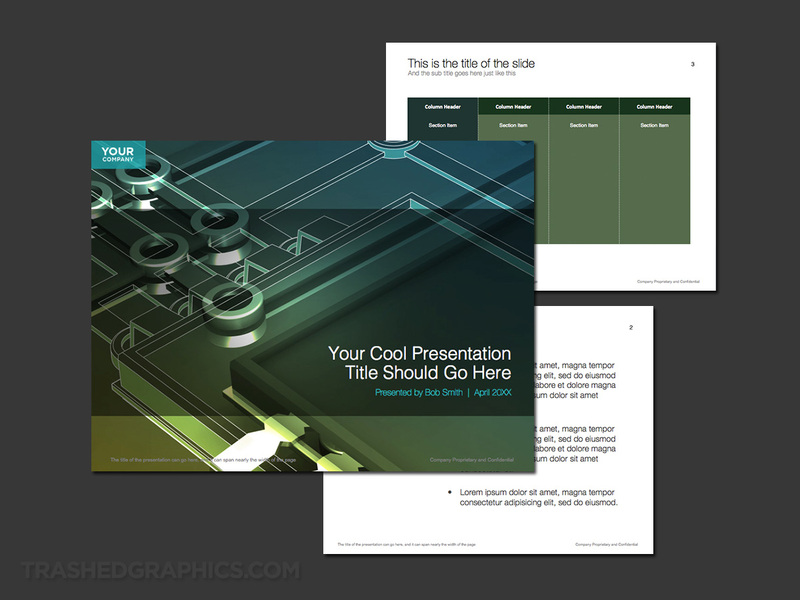 The light version allows some of the white page color to show through on the interior slides, which makes for clearer content containers and a stronger visual grid. Fully editable Microsoft PowerPoint presentation template. Includes cover, text, and table pages. Green and gray Evernote theme with light colored background. The dark version is…well…dark. I know that not everyone likes dark presentation slides like that, but they are useful sometimes if you have a lot of images to show. They will contrast with the dark background nicely. 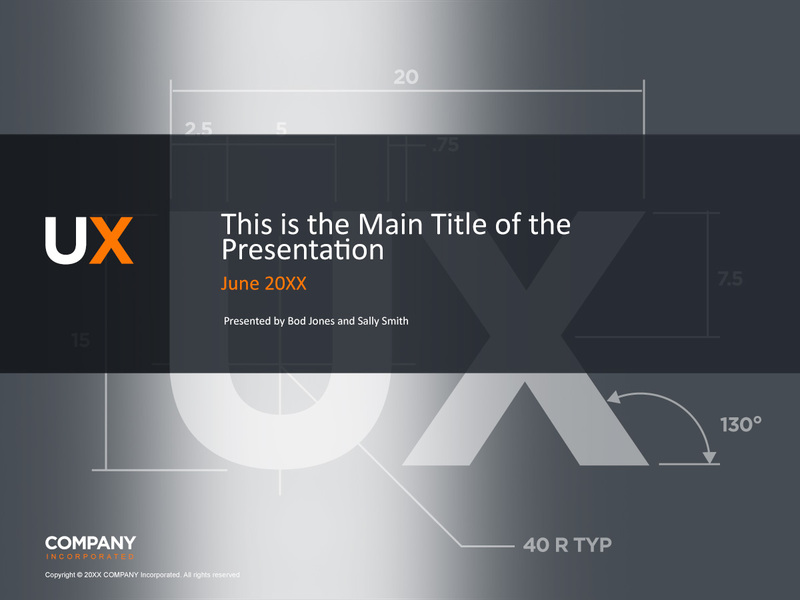 Fully editable Microsoft PowerPoint presentation template. Includes cover, text, and table pages. 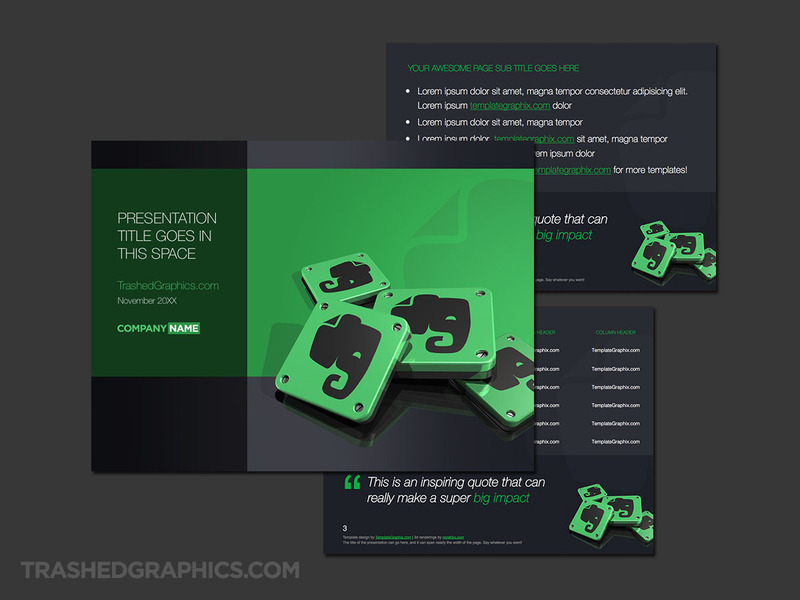 Green and gray Evernote theme with dark colored background. You’ll also notice that I decided to use full-width tables for both versions instead of the smaller floating tables that I normally use. Full-width is the way to go in my opinion, as it’s always better to maximize the entire slide and let the content breath a little. Feel free to use whichever template you prefer, and don’t be afraid to mix and match elements from both if you prefer. The design language (and color palette) are the same for both so there’s no reason why you can’t mix these two templates together.